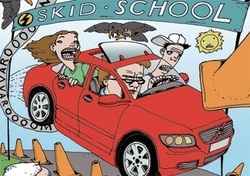 New Hampshire Magazine goes to skid school! "... Far off and safely to the right, small planes come and go, an incessant bee-buzz announcing a sprint to rotation and takeoff ... To the left, safe in the rustling grasses, stunted trees and sandy, dry pine barrens, rare and endangered Karner Blue Butterflies do silent takeoffs and landings of their own. But here, twixt the two schools of flight at the Concord Airport, Aaron Cottreau, 16, has made a landing of his own - in the seat of a Volvo where, on an abandoned, clearly demarcated strip of runway, he's ready for takeoff, where he will learn driving secrets that should not be secret; that every young driver must know and every older driver should know." Click here to read the whole article. Click and Clack the Tappet Brothers send one of their unsuspecting Car Talk staff to Skid School. Click here to read all about her experience. Skid School In Massachusetts. The Eagle Tribune interviews Skid School Founder Sandy Stevens. Jill Harmacinski reports. "... Seatbelted behind the wheel of the Volvo sedan, Brienne Toomey slammed on the brakes and sailed threw a slalom course of bright orange traffic cones. Later, she learned why tailgating another car is dangerous and how she could avoid it." Click here to read the whole article. Click here to read what Skid School Founder Sandy Stevens has to say about seat belts. While this article was written in 1990, when seat belt laws were still being debated, Sandy's points about driver and passenger safety are as relevant as ever.